On “The Late Show,” Stephen Colbert was so flummoxed by the president’s behavior when meeting with Russian President Vladimir Putin that he offered up a “double-stuffed” monologue, committing more than 13 minutes to the meeting of the minds. “What is it going to take for you to acknowledge that Putin directed his officials to help you get elected?” Colbert asked after sharing a clip of Trump disavowing U.S. intelligence agencies’ assessment that Russia interfered in the 2016 election. Cue video of just that. Over on NBC, “Late Night” host Seth Meyers wanted to put things in perspective, taking the time to lay out just how bad the president’s entire European tour had been. From breaking royal protocol with Queen Elizabeth II, to completely misunderstanding Brexit, to insulting the European Union, Trump was a mess, Meyers gleefully asserted. But that was nothing compared to the Trump-Putin summit. “So just to recap: Trump blamed the U.S. for Russian aggression, attacked the FBI and the special counsel’s investigation, took Putin’s side on election meddling, attacked Democrats and Hillary Clinton with Putin standing next to him and said Putin was strong and powerful,” Meyers summarized of the joint presidential press conference. “Can you imagine what their private meeting was like? I’m worried he let Putin annex one of the 50 states,” he joked. Jimmy Fallon didn’t have quite as much to say about Trump and Putin’s meeting, but he got his jabs in where he could. As for negotiations between the men, Fallon figured it went pretty well. 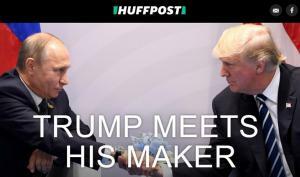 “According to experts, Trump and Putin had a lot to negotiate in their meeting. Trump says negotiations went great: Putin now controls New York and California, and in exchange, Trump got three magic beans,” he said. Like Meyers, Jimmy Kimmel opted to open with a long view on Trump’s time in Europe. But Kimmel got truly slap-happy after showing the clip of President Trump declaring that he didn’t see why Russia would have interfered in the 2016 election. “Well, I guess that settles it. There you go. If you’re wondering whether or not Vladimir Putin has an incriminating video of Donald Trump, we now know, beyond a treasonable doubt, that he does, Kimmel joked. Trevor Noah was just as stymied as anyone by Trump’s relationship with Putin. After showing a clip of a former U.S. ambassador to Russia stating that it was “the single most embarrassing performance by an American president on the world stage that I’ve ever seen,” the “Daily Show” host was shocked. To say that Noah was unimpressed would be an understatement. Watch all of Noah’s mildly unsafe-for-work commentary here. Can you trust Trump voicing on Tuesday support for US intelligence agencies, a day after he refused to accept their findings on Russia’s election meddling over the denials of Russian President Vladimir Putin, and vowed to take action to prevent further interference? Treason of yalibnan: Kannibal, OmegaHell are not active more? The European leaders looking after new friends after Donald ‘Teflon’ Trumps and drug adicted Vladimir Putin’s affectionate meeting in Helsinki. The fact that a former, obviously ally to Europe – the United States – now seems to want to cooperate with the EU’s largest antagonist Russia, has made European leaders react with strong skepticism. Now it will be easier for us to demand USA to take home their military forces from Germany.